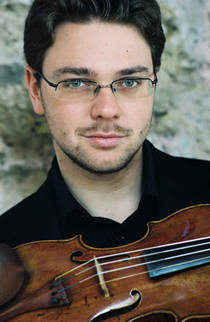 Alexander Sitkovetsky, violin, was born in Moscow in 1983 into a family with an established musical tradition. At the age of eight he was invited to become a pupil at the Yehudi Menuhin School in England studying the violin with Natasha Boyarsky and, on leaving the school, with Pavel Vernikov. Since their first meeting in Moscow in 1990, Lord Menuhin became a great inspiration for Sitkovetsky, supporting him through his early years. Together they performed the Bach Double Violin Concerto in France and Belgium, and Bartok’s Duos at St James’s Palace, London. In 1996, Sitkovetsky played Mendelssohn’s Violin Concerto in Budapest with Lord Menuhin conducting. Sitkovetsky has performed in many international music festivals throughout the world, and has been featured as a soloist at major venues, including The Royal Festival Hall, Queen Elizabeth Hall, Wigmore Hall, St John’s Smith Square in London, Sala Verdi in Milan, Palais des Congres in Antibes. He was partnered by Bella Davidovich for his New York debut at the Frick Collection. He has taken part in a BBC documentary and has made numerous television appearances in the UK, recently featuring as a soloist in the much-publicized Tchaikovsky Experience on the BBC. Sitkovetsky is also an accomplished composer. His two orchestral ballet scores were premiered in collaboration with the Royal Academy of Dance in 1995 and in 1999 at Queen Elizabeth Hall, London. In 1998 he took part in a master class given by Maxim Vengerov which was broadcast over the European TV network. Sitkovetsky has released two CD recordings for EMI/Angel, which have received unanimous critical acclaim: the first a recital and the second featuring concerto performances by Bach, Mendelssohn, Panufnik and Takemitsu. This year he has recorded, with Dinorah Varsi, the Mendelssohn Double Concerto for Orfeo and also, with Julia Fischer, the Bach Double Concerto for Decca. Over the past few years, Sitkovetsky has performed with the Moscow Chamber Orchestra, English Chamber Orchestra, City of London Sinfonia, the Royal Philharmonic Orchestra, the BBC Concert Orchestra, the Eisenach Theatre Orchestra and the Stuttgart Chamber Orchestra among many others. In March 2009 Sitkovetsky made his Concerto debut at the Amsterdam Concertgebouw, performing the Elgar Violin Concerto with the Netherlands Philharmonic Orchestra and Yakov Kreizberg and will shortly be making his debut with the Monterey Symphony Orchestra in the USA.